Tim Quelch is an admirable man: a retired local government social care worker who now writes books and gives the proceeds to charity. Tim Quelch also sounds a very interesting man as I found out after reading Stumps & Runs & Rock N’Roll. I must say that, when I started the book, I did wonder how he might fill sixty years of his life watching cricket into the 288 page book and even more so when I saw the size of the print. That said, it quickly became a fascinating book and could almost be seen as a microcosm of England since he came into the world. Each year and, towards the end of the book, chapters encompassing a number of years, since he became aware of cricket have their own entry of the year’s cricket, political and musical events although cricket is the predominant theme. The precis of the cricket is interesting but I found the country’s events and musical reminiscences not only fun but informative. Granted, music is not my strong point so I was grateful for the accompanying facts. Each year and chapters are named after a song of that year/era and, whilst Tim’s choices are rarely ones that I have heard of, he has undoubtedly taught me a thing or two and, from the 1970s, brought back memories of life in England on and off the field. What is most noticeable is Tim’s joie de vivre which comes across in his writing. Well-written, highly readable, entertaining and what a change to see a book written by the author and not a ghost writer. He seems to have enjoyed writing it although the sadder aspects of his job as a care worker do occasionally come over. Tim’s enthusiasm for cricket is a pleasure to read about. Keen cricket buffs may recognise quite a few of the events and facts but there are also more than a few lesser known and interesting ones. 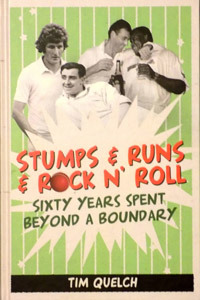 Stumps & Runs & Rock N’ Roll is almost an encyclopaedia of England from the late 1940s to the present day and is a most enjoyable read. There is no doubt that he writes not only very well but humorously and brings back memories of some of the great performers of yesteryear. Tim’s descriptive powers regarding players are also a treat. Stumps & Runs & Rock N’ Roll deserves to do well for the money it generates for, amongst others, the Alzheimer’s Society and Parkinson’s UK. Even without this worthy cause, it deserves to do well because it is a fun and highly enjoyable book.